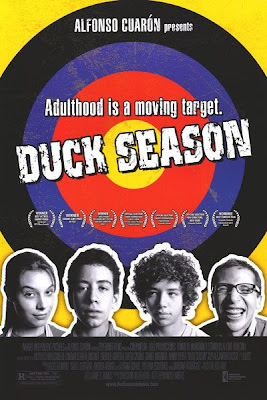 Duck Season (2005), Fernando Eimbcke's smartly observed, wry, and unexpectedly moving Mexican comedy, unfolds slowly, much like the lazy Sunday afternoon that the film depicts. But if you don't mind giving in to the movie's deliberate pacing, you'll find an understated masterpiece that's rich in character, a film whose culminative effect packs quite a punch. Two teenage best friends—one boy caught in a tug of war due to his parents' divorce, and one kid just starting to figure out love and romance—are left alone to reign over an apartment, a privilege that entails playing video games, eating chips, and drinking Cokes. However, a power outage thwarts their plans, but also brings them company in the form of a pretty neighbor girl who comes to use the stove to bake a special cake for a special reason and a frustrated thirtysomething pizza delivery man who dreams of making enough money breeding parakeets to someday run away from home. It's funny, it's tender, it's edgy. And its perfectly underplayed exploration of young love and heartbreak is really something. And, yes, for those of you who care about such things, there are some gay undertones. For those of you who don't care about such things, the gay undertones are minor. For everyone else (is there anybody left? ), the film can be likened to Jim Jarmusch's Stranger Than Paradise, the films of Hal Hartley, and Y Tu Mama Tambien. By the way, keep watching through the end credits for a final scene and a final laugh. BAMBOO NATION: Unsung Movies: "Duck Season"